Mark Bingham was a rugby player and public relations executive who was openly gay. Known for his tall stature, athletic physique, independent and self-driven personality who “marched to his own beat”. He was the only child of Alice Hoagland and Gerald Bingham and growing up in Florida and later Southern California he was an aspiring filmmaker and recorded hundreds of hours of his life on his home video camera. 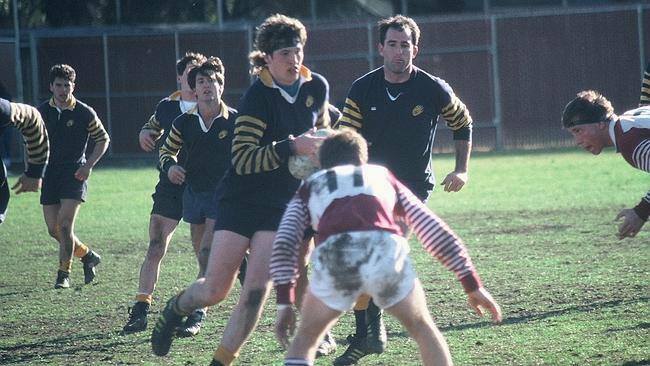 Bingham graduated high school as the captain of the rugby team and attended UC Berkeley where he played rugby for coach Jack Clark and helped lead the team to 2 national championships in 1991 and 1993. Upon graduation from college after his 21st birthday, Mark Bingham came out as gay to his family and friends. He was known for his courage, having foiled several mugging attempts, including wrestling the gun from a mugger one night in San Francisco. He spent a few nights in jail after tackling Stanford University’s mascot during a football game and even took part in Spain’s famous “Running of the Bulls” where he got caught on the horn and eventually trampled by a bull. He proudly showed off the hoof print on his leg whenever he could. Playing for the San Francisco Fog RFC a gay-inclusive rugby team, Bingham shared his time between San Francisco and New York City where he opened the second branch of his public relations firm Bingham Group. His mother once remarked that she marveled that Mark paid 3x as much in taxes compared to her full salary, he opened his business on the cusp of the 1990s tech boom. He was very passionate about his business and rugby, even talking plans to start a gay rugby team in New York City called Gotham Knights RFC. On September 11th, 2001 Bingham was heading back to San Fransisco to take part in a friend’s wedding. He almost missed his flight when he overslept but managed to make the flight just in time. He was the last passenger to board United Airlines Flight 93. Scheduled to depart at 8am, due to runway traffic the plane took off 42 minutes. 4 minutes after take off while climbing to cruising altitude AA Flight 11 crashed into the North Tower of the World Trade Center. 15 Minutes later UA Flight 175 hit the South Tower. As flight 93 flew over New Jersey toward Pennsylvania the pilots Jason Dahl and Leroy Homer received a warning “Beware of Cockpit Intrusion”. 3 minutes later hijackers had begun their assault and assumed control of the aircraft, disengaging the autopilot and informing passengers that there was a bomb on board. The passengers were ushered to the back of the airplane as the hijackers changed course en route to Washington DC. In the back passengers were making phone calls to loved ones, fearing the worst they said their good byes and learned of the planes that hit the World Trade Center and the Pentagon. Bingham called his mom to tell her that he loved her. Together with fellow passengers Todd Beamer, Tom Burnett and Jeremy Glick, Bingham put together a plan to take back the plane. All the passengers and flight attendants voted together that the best plan would be to storm the cockpit and take control of the plane. According to the plane’s voice data recorder, there was pounding on the cockpit door and screams in english “Let’s get them!” The hijackers attempted to knock the passengers off their feet by repeatedly pitching the plane. However, the passengers, including Bingham managed to breach the cockpit to fight the hijackers. The plane was pitched a hard right where it rolled over onto it’s back and crashed into an open field in Shanksville, PA. All on board perished. The plane was less than 20 minutes from its target which was either the White House or the Capitol. The passengers and crew of United Flight 93 are heroes and are often remembered and honored for their courage. Bingham is survived by his family and partner of 6 years, Paul Holm who remembers Bingham for his courage and protection of loved ones in any situation. In his honor the Gotham Knights RFC was established and the semi-annual world cup of gay rugby was renamed the Bingham Cup in his honor. His legacy was honored shortly after the attacks by Senators John McCain and Senator Barbara Boxer who presented a flag to Holm in a ceremony honoring San Francisco Bay Area victims of the attacks. Posthumously he was awarded the Arthur Ash Courage Award and his name is further memorialized at the 9/11 memorials in New York on the south pool, panel S-67 and in Pennsylvania at the Flight 93 National Memorial. The 2013 documentary The Rugby Player focuses on Bingham’s relationship with his mother and utilizes much of the footage Mark had filmed in his youth. His mom Alice Hoagland, a former United Flight attendant has gone on to become a prominent activist for airline safety and LGBT rights.